Horizon Hobby is proud to announce their newly expanded marketing sponsorship with the Rockstar Energy Racing Motocross team. Established in 2009, Xtreme Amateur and Pro Lites is the one of the most elite teams competing in AMA 250 Supercross, AMA 250 Motocross and now the premier class 450. Horizon Hobby joins prestigious partners including Motosport.com, Bel-Ray, ONE Industries, Airoh Helmets, FMF, Dragon Goggles, Rockwell Watches, Go Pro as well as Suzuki. With the support of race organizations like Feld Motor Sports and MX Sports, Supercross and Motocross have experienced exponential growth over the past decade and have gained millions of new spectators and television audiences. “This is an exciting partnership with loads of potential, the growing interest in motocross helps with expanding the reach of our efforts while focusing in on our core customer base,” says Kevin Wilson, Horizon Hobby Brand Manager. The riders played a key role in the decision to sponsor the Rockstar Suzuki Motorcross team “with such talented riders as Davi Millsaps and Martin Davalos it was difficult to find another team with such potential,” added Joe Schamuhn, Horizon Hobby Vice President of Strategic Marketing. 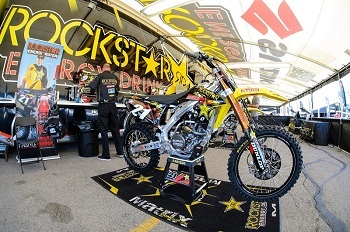 The 2013 SX/MX Rockstar Energy Racing team consists of Jason Anderson, Daniel Baker, Nico Izzy, Davi Millsaps, Ryan Sipes and Blake Wharton. As the RC market continues to expand, Horizon Hobby hopes sponsorships like these will continue highlight their products among to the growing demographic of Motocross enthusiasts. If you like this article, check out this additional article on Horizon Hobby.